Although it is a tiny town of about 500 people, Springdale hosts thousands of visitors every year. 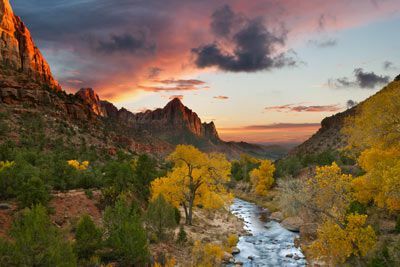 Located just outside beautiful Zion National Park, Springdale is the gateway to everything the park has to offer: rugged bike trails, challenging hikes, brilliant wildlife and breathtaking vistas. 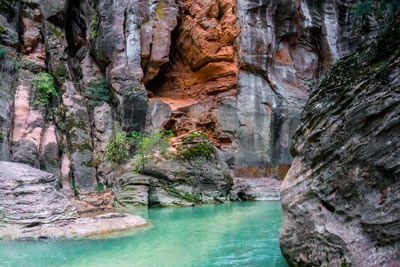 Go rappelling and rock-climbing along the steep sandstone formations that encompass this beautiful region, or jump on a raft and float your way over the rapids and eddies of the Sevier River. 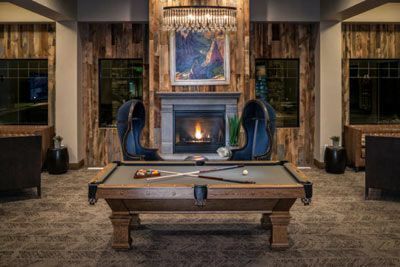 The town’s lodgings and services accommodate travelers on their way to and from discovering the incomparable beauty of Utah. Shop the best of Springdale for one-of-a-kind keepsakes at one of the many galleries in town. LaFave Gallery is a great place to start, offering upscale gifts of jewelry, paintings, and kinetic sculptures. Pottery and outdoor art including wind chimes and spinners are a specialty at Worthington Gallery. DeZion Gallery features local artists of every medium. When it’s time to dine, head to Bit & Spur for Southwestern favorites, or try Switchback Grille & Trading Company’s fine cuisine. Our host hotel is NOT located inside the Park. 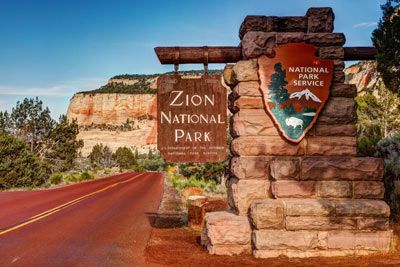 All park visitors are required to purchase a recreational use pass (approximately $20 per person) upon entering Zion National Park, cost is approximately $35 for one private vehicle and admits all occupants to Zion National Park, including both the Zion Canyon and Kolob Canyon areas. Fees subject to change without notice. Visit https://www.nps.gov/zion/index.htm for more information. 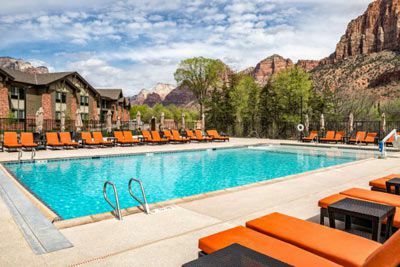 The SpringHill Suites, Springdale Zion National Park, offer a comfortable yet elegant setting for travelers seeking inspiration, family adventure, or relaxation. Located one mile from Zion’s gate and a short distance from Bryce Canyon, the Grand Canyon North Rim, Lake Powell, Coral Pink Sand Dunes State Park and Best Friends Animal Sanctuary, this hotel is centrally located to explore everything southern Utah has to offer. 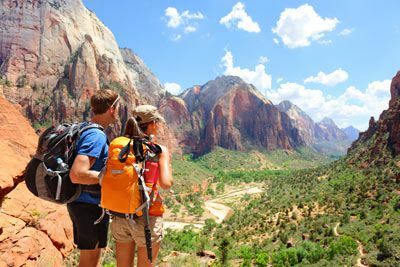 After an exciting day of hiking, biking, climbing or horseback riding, enjoy the outdoor pool and hot tub with amazing canyon views, splash pad, balconies, patios and fireplaces, or stroll along the Virgin River and take advantage of the dark night sky. In addition to the daily complimentary hot American-style buffet breakfast, guests can also grab a quick snack from the on-site convenience store. 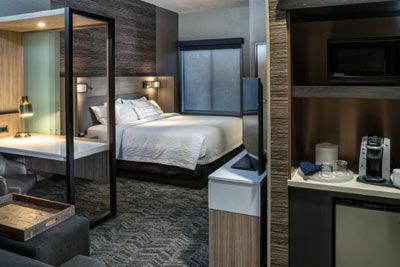 All guest suites feature LCD TV, coffee/tea maker, mini-refrigerator, microwave, alarm clock, iPod dock, iron/board, spa-inspired bathroom, hair dryer, and more. Standard Suites are approximately 350 sqft. and feature 1 King or 2 Queen beds plus Twin pullout sofa bed. Premium Suites are approximately 450 sqft., with 2 Queen beds plus Twin pullout sofa bed, and an outdoor patio. 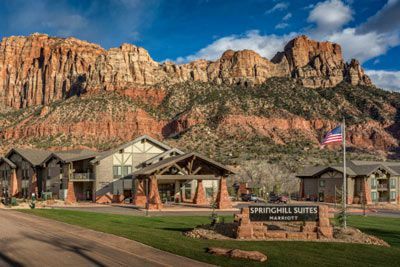 The SpringHill Suites Springdale Zion National Park is located approximately 45 miles from the St. George Municipal Airport (SGU), 166 miles from the McCarran International Airport (LAS), and 312 miles from the Salt Lake City International Airport (SLC). Having a car is highly suggested and will allow you to fully explore the area. Parking at the hotel is complimentary. $100 August 13, 2020 to September 12, 2020. No refund after September 12, 2018; however, 50% of tuition paid may be applied toward tuition for another NWAS program within the next 12 months. Cancellation must be made in writing.